4 April 1916: Entered the Royal Bavarian Army as a War Volunteer in the Replacement Battalion (I Recruit Depot) of the Bavarian 11th Reserve Infantry Regiment. 21 July 1916: Allocated to the 2nd Company of the Replacement Battalion of the Bavarian 11th Reserve Infantry Regiment. 12 August 1916-11 October 1916: Group Leader Course with the Bavarian Deputy 12th Infantry Brigade. 4 December 1916: Transferred to the 1st Company of the Bavarian 11. Infanterie-Regiment von der Tann. 12 October 1917: Transferred to the Replacement Battalion of the Bavarian 11th Infantry Regiment. 18 October 1917-31 January 1918: Detached to the 9th Training Course for Fahnenjunker and Officer Aspirants in Grafenwöhr. 23 March 1918: In the field with the 1st Company of the Bavarian 11th Infantry Regiment. 1 June 1918-6 June 1918: Deputy Battalion Adjutant in the Bavarian 11th Infantry Regiment. 7 June 1918: Deputy Leader of the 1st Company of the Bavarian 11th Infantry Regiment. 15 July 1918-17 July 1918: Detached to the Training Course for Leaders of Photographic Offices. 21 July 1918-18 August 1918: Deputy Battalion Adjutant in the Bavarian 11th Infantry Regiment. 10 September 1918: Delegated with the leadership of the 3rd Company of the Bavarian 11th Infantry Regiment. 16 September 1918: Transferred to the 3rd Company of the Bavarian 11th Infantry Regiment. 1 October 1918: Granted a Company Leader position in the 10th Company of the Bavarian 11th Infantry Regiment, but instructed to remain with the 3rd Company for the time being. 7 October 1918: Named the Company Leader of the 10th Company of the Bavarian 11th Infantry Regiment. 14 April 1919-22 June 1919: Deputy Regimental Adjutant of the Bavarian 11th Infantry Regiment. 22 June 1919: Ordonnanz-Offizier of the 6th Bavarian Reichswehr Infantry Regiment 48 of Reichswehr-Brigade 24. 29 June 1919-10 July 1919: Deputy Regimental Adjutant of the 6th Bavarian Reichswehr Infantry Regiment 48 of Reichswehr-Brigade 24. 5 August 1919: Ordonnanz-Offizier on the Staff of the 6th Bavarian Reichswehr Infantry Regiment 48 of Reichswehr-Brigade 24. 8 September 1919-16 September 1919: Deputy Battalion Adjutant in the 6th Bavarian Reichswehr Infantry Regiment 48 of Reichswehr-Brigade 24. 1 December 1919-16 September 1919: Deputy Regimental Adjutant of Reichswehr Infantry Regiment 48 of Reichswehr-Brigade 24. 2 December 1919: Assigned as the Regimental Weapons Officer. 11 March 1920: Military Ski Course in Sonthofen. 18 March 1920: Sprained his ankle at the Military Ski Course and admitted into the Lindau Reserve Hospital. 27 March 1920: Returned to his regiment. 16 May 1920: Company Officer in Reichswehr Infantry Regiment 48 of Reichswehr-Brigade 24. 1 October 1920: Transferred as a Company Officer to the 20th (Bavarian) Infantry Regiment upon the formation of the new Reichsheer from the Übergangsheer or Transitional Army. 28 October 1920: Detached to the staff of the 20th (Bavarian) Infantry Regiment as an Ordonnanz-Offizier. 5 February 1921-10 February 1921: Duty assignment to the Ski Races near Oberstdorf. 26 February 1921-27 February 1921: Duty assignment to the Ski Races near Schliersee. 28 March 1921-11 April 1921: Ordonnanz-Offizier on the Detachment Staff “Leupold” for the suppression of civil unrest in central Germany. 1 October 1921: Transferred to the 2nd Company of the 20th (Bavarian) Infantry Regiment. 23 March 1922-27 March 1922: Detached to the Ski Races near Schliersee. 21 September 1923-5 May 1924: Detached to the II Course at the Infantry School. 18 May 1924: Detached to the Infantry Gun Course in Grafenwöhr. 15 September 1924-17 October 1924: Detached to the Machinegun Course at the Grafenwöhr Troop Training Area. 5 May 1926-18 May 1926: Participated in Artillery Familiarization Training in Münsingen. 5 August 1926-25 November 1926: Detached to the XIII Course for Physical Education in Wünsdorf. 27 October 1926-10 December 1926: Detached to the Ski Course in Allgaü. 17 January 1927-15 June 1927: Detached to the XIV Course for Physical Education in Wünsdorf. 1 March 1928: Transferred to the 4th (Machinegun) Company of the 20th (Bavarian) Infantry Regiment. 1 October 1928: Detached to the Infantry School as a Supervision Officer and Instructor. 12 March 1929: Ill with facial erysipelas (Gesichtsrose). 11-16 March 1930: Sat for the Wehrkreis-Prüfung to determine eligibility for General Staff training. 1 October 1930: Transferred to the staff of the 7th Division. 1 October 1932: Transferred to the staff of the Commandant of Berlin with duties determined by the Chief of the Troop Office. 1 October 1933: Transferred to the Armed Forces Office of the Reich Defense Ministry and granted the right to carry the Uniform of a Leadership Staff Officer. 1 June 1935: Transferred to the General Staff of the Mountain Brigade. 1 April 1938: Transferred to the General Staff of the 1st Mountain Division. 10 November 1938-14 October 1939: Operations Officer (Ia) on the staff of the 1st Mountain Division. 15 October 1939-24 October 1940: Operations Officer (Ia) in the General Staff of the XVIII Army Corps; redesignated the XVIII Mountain Army Corps on 1 October 1940. 25 October 1940-19 April 1943: Chief of the General Staff of the XVIII Mountain Army Corps. 19 April 1943-31 May 1943: Army High Command Leader Reserve – duties determined by the Chief of the Army Personnel Office (P 3) (on leave). 5 July 1943: Receipt of proposal for award of the German Cross in Gold (3088) by the Army Personnel Office/Oberst i.G. and Chief of the General Staff of the XVIII Mountain Army Corps (rejected on 9 July 1943). 20 August 1944: Commander of the 6th Mountain Division in Finland and Norway. 4 April 1945: Army High Command Leader Reserve – considered for employment as the Battle Commandant of Berlin (posting not made effective). 10 April 1945-27 April 1945: Chief of the General Staff of the Ligurian Army commanded by Maresciallo d’Italia Rudolfo Graziani. 27 April 1945-28 April 1948: Captured in the vicinity of Lake Como, Italy – prisoner of war in U.S. and later British captivity. 26 April 1956: Returned to military service in the post-World War II German Bundeswehr with the rank of Generalmajor and appointed Commander of Wehrbereich [Military District] VI (München). 1 April 1957: Commanding General of the II Corps in Ulm/Donau. 30 September 1961: Retired from the Bundeswehr. Knight’s Cross of the Iron Cross: 9 December 1944, Generalmajor, Commander of the 6th Mountain Division. Prussian Iron Cross, 1st Class (1914): 30 June 1918. Prussian Iron Cross, 2nd Class (1914): 30 June 1917. 1939 Clasp to the Prussian Iron Cross, 1st Class: 20 October 1939. Cross of Honor for Combatants 1914-1918: 15 March 1935. Austrian War Commemorative Medal with Swords: 20 May 1937. Hungarian War Commemorative Medal with Swords: 8 March 1937. Finnish Order of the Cross of Liberty, 2nd Class with Swords: 30 June 1943. Bavarian Merit Order: Post-World War II award. Mentioned in the Wehrmachtbericht [Armed Forces Communiqué]: 3 November 1944. During the night of 9 to 10 October 1944, the 6th Mountain Division withdrew from its exposed positions on the Litsa. In the area of Petsamo, it came under attack from the Soviet 14th Army, which was supported by the Soviet Northern Fleet. On 12 October 1944, a Russian amphibious operation took place in the port of Liinahamari (10 kilometers north of Petsamo). In heavy rearguard fighting, General Pemsel personally prevented an encirclement of the XIX Mountain Army Corps. His division succeeded in opening the Petsamo-Kirkenes road which had been previously cut. This achievement was recognized in an Armed Forces Communiqué on 3 November 1944. An encirclement of the 6th Mountain Division had been avoided owing to the skillful guidance of the divisional commander. The Longest Day (1962), Wolfgang Preiss. Mitcham, Samuel W. Jr. & Mueller, Gene. Hitler’s Commanders. Scarborough House, Lanham, Maryland, 1992. Thomas, Franz & Wegmann, Günter. Die Ritterkreuzträger der Gebirgstruppe, Band 2: L-Z. Biblio Verlag, Osnabrück, Germany, 1994. On 28 June 1944, Generaloberst Dollmann died at his headquarters in Le Mans, France. While his official cause of death was reported as a heart attack, Pemsel believed Dollmann committed suicide by poison. After keeping the information secret for many years, Pemsel disclosed it to British historian David Irving who recounted the revelation in his book The Trail of the Fox, a biography of Generalfeldmarschall Erwin Rommel, published in 1977. 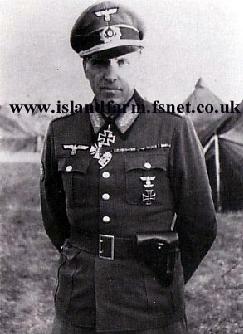 SS-Oberst-Gruppenführer und Generaloberst der Waffen-SS Paul Hausser succeeded Dollmann to command of the 7th Army.